>> Use to view details about the active auction. >> Use to auction off more than a stack of the same item. >> Use to start an auction at predetermined price with the item in your hand. >> Use to shorten the time your auction runs for. >> When you start an auction, you will be provided with the auctions ID, in which you can use to cancel one of your upcoming auctions. >> Use </auc ignore> to prevent auction messages from showing up in your chat. Use </auc listen> to permit auction messages from showing up in your chat. 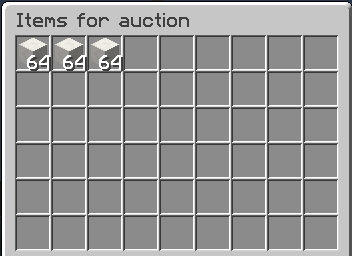 Starting an auctions costs $2. YOU CANNOT CANCEL AN ACTIVE AUCTION. BE CAREFUL WHAT YOU SELL.